Camping Pâquier Fané är en camping i Chagny, Saône-et-Loire, belägen vid en flod/ en bäck. Campingen har platser med stängsel, med skugga, utan skugga och platser med lite skugga. Det finns möjlighet att hyra husbilar, vandrarstugor och bungalows. På campingen finns en ett sportområde. Denna inspektör gör varje år ett besök på Camping Pâquier Fané och inspekterar campingen för ca 200 faciliteter och för andra förekommande punkter. Inspektören är en medarbetare från ACSI och arbetar inte för campingen. Great location for exploring Burgundy, close to attractive town of Chagny. Access to local pool restricted to certain times-also restrictions on swimming costumes for men. ( not unusual in France, but nowhere to buy appropriate costume locally)outstanding staff, friendly helpful and multilingual. A good stopover when heading along the north/south autoroute. Very friendly, clean and tidy. Close to a pleasant small town and the Canal du Centre for good walking or cycling. Very welcoming staff. Can chose your preferred pitch (even if reception is closed). Very well kept grounds. Good toilets and showers. Right on edge of a small town with plenty of shops. Great for cycling as the voie verte is minutes away. This was one of our favourite sites during our three week holiday. On edge of pleasant small town. Nice well run site. Good cycling along local canal and Voie Verte. Only problem was noise from the town lorries and nearby rail line. Good for short stop over and visiting Burgundy. Previously used Beaune as stopover for heading south, but this site is much roomier and more convenient. Well defined grass pitches. If you arrive when reception is closed you are directed via a notice to choose your own pitch. We had lots of choice at 3pm, but by 4.30pm the site was filling up and the pitches farthest from reception have obviously not been used for a while and could have done with a trim. Also, these appeared to be the nearest to the railway line. We pitched on number 5 and could hardly hear the trains. The toilets and showers are unisex and were very clean. Plenty of hot water. No toilet seats or toilet paper. The town is a ten minute walk away with plenty of bars and restaurants. We ate at Le Grenier a sel which was reasonably priced and good food. The advert in the CC book says that the snack bar, takeaway meals, pizzeria and restaurant on site are open until 30/09, however they had closed 31/8. Arrived after a large rain storm; pitch was very muddy (we except this no-ones fault) water and drainage fine no problems with electrics, found lots of work going on at the far end of site only pitches avaiable around top area near reception. The toilet facilities very clean&tidy but getting ready for up-grade. We stayed four nights and travelled around this area; lots to see - also Chagny was nice to look around. This was the first visit to this site as we had never noticed it before. It is ideally located for an overnight stop but warrants a longer stay. The second toilet at the far end of the site was very clean and acceptable with refurbished showers. The block at reception looked good too. Very friendly and helpful husband and wife team run it and they were very keen to retain high standards when a group of grape pickers were dropping litter around their pitch. Listed as 16 amp but beware not all are, some on same outlet posts were only 6amp, which I found out and made me scratch my head! Chagny is delightful and a short walk, and make sure you walk along the canal. Wifi is free but any further away than the first field and it disappears but only a short walk to reception. Definitely a site for a revisit when next passing south or north. Reasonable campsite, generally fair-sized grass pitches but poorly drained. Pleasant staff, good well-kept san facs. Easy walk into town for shopping & access to canal-side cycle routes. However, if you are a light sleeper, take your ear-plugs - trains rumble by, day & night. Had a very pleasant stay here for 3 nights. Friendly and helpful staff; the manager even opened the second sanitaires when he realised how the site was filling up. Everything very clean and tidy. After a few days of heavy rain, pitches were a bit muddy; the site would benefit from some hard standings. Excellent location for access to town and easy cycling on the canal and vineyards. Stayed at this camp on way back to ferry from Cote D'azure. Stayed an extra day as was so nice and had a manic rush to catch the ferry. Staff very helpful and friendly bread orders taken. No beach or pool but the gorgeous village 2 mins walk more than made up for it. There was an indoor council pool in the sports ground next door but this was had shut in August but looked ok. There were also table tennis and a pitch for badminton with a net on site. All the pitches were a good size with neat hedges for boundaries. There was a brand new shower and toilet block really good and also the old one had been updated and was clean and pleasant. There were many nice and easy bike routes, great for kids or beginners like me. The route along the canal was lovely really quiet and flat went on for miles. The best bit for me was just walking around the village really picturesque lots of old and interesting buildings. Lady in the Tourist Information office very helpful and full of ideas. Vill du boka campingen Camping Pâquier Fané eller få mera information? Det går bra med nedanstående uppgifter eller via campingens webbsida. 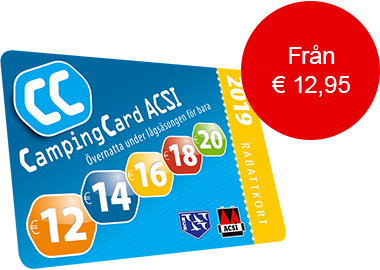 ACSI Eurocampings skickar din informationsförfrågan till "Camping Pâquier Fané".